In the seventeen and eighteen hundreds, Naples was a flourishing city, nestled on prime waterfront land, filled primarily with working class people. These Neapolitans needed inexpensive, sustainable food to feed their large families. Bread, tomatoes, and cheese were staples in the area, and could fill and fuel the hard working lazzaroni. 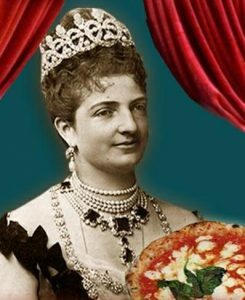 It was a diet frowned upon by the upper class Neapolitans, but when King Umberto I and Queen Margherita of Italy visited Naples in 1889, the destiny of the infamous pizza changed forever. Queen Margherita was incredibly fond of the lazzaroni creation, and preferred the (now iconic) combination of mozzarella, tomato and basil, dubbed the pizza “Margherita” after it’s first royal patron. At Alfresco Pasta, we pride ourselves in following the true Italian tradition. Our Pizza dough is made in the traditional style of Naples, with hard spring wheat which requires less kneading. With a shorter kneading time our dough is soft rather than chewy, and can accommodate many shapes and styles of pizza making. 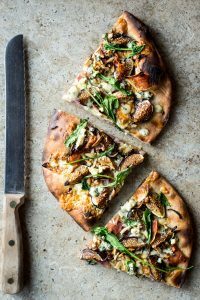 Here’s how you can make a perfect pizza at home, in your conventional oven, without a stone. 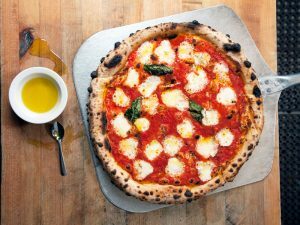 Step 1: Preheat the oven to 500 degrees Fahrenheit or higher, don’t be afraid to crank the heat, the faster you can cook the pizza, the better the crust will be (crispy on the outside, gooey on the inside, in the style of Naples). Cut 1-20 ounce Alfresco Pasta pre-proofed dough ball in half, flattening and rolling one half onto a cornmeal dusted cookie sheet. Roll and stretch the dough until you reach your ideal shape and thickness. Step 2: don’t follow a recipe! dress your pizza with your favorite toppings creating your ideal ratio of cheese to sauce, sauce to crust ect. 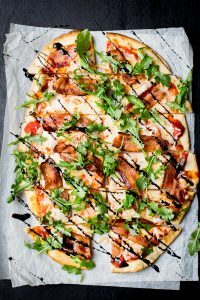 Try unique combinations like caramelized onions, figs and goat cheese, or arugula, balsamic reduction and bacon! Hint: minced garlic and truffle oil add a magnificent touch to any pizza.